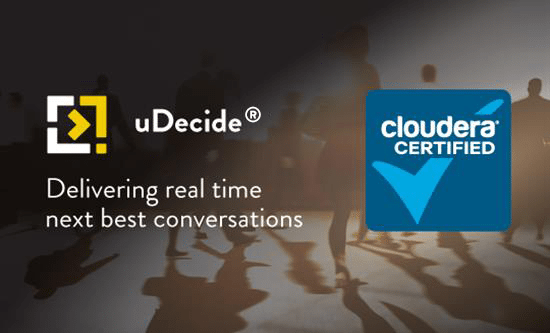 uDecide®, our machine learning solution that helps you leverage your customer data and determines your next best conversation with each customer in real-time, is now certified as Cloudera Technology. This partnership expands our real-time data decisioning capabilities to the Cloudera Enterprise 5 platform. uDecide® helps organisations that often find themselves overwhelmed with data and are not sure how to optimise its use. At the heart of uDecide® is a machine learning engine that looks at each customer’s dataset (behaviours, transaction history, preferences, and more), scores the offers, and determines the most relevant communication for each individual. For organisations, this means more relevant conversations, happier customers, and incremental revenue. The Cloudera Certified Technology program makes it simpler for Apache Hadoop technology users or buyers to choose the right technology, so you can extract the most value out of your data. Technologies that are Cloudera Certified have been tested and validated to work with Cloudera Enterprise, Cloudera’s 100 percent open-source Apache Hadoop platform. uDecide® helps you demystify the complexity of your data in order to make real time decisions on the message or offer your customers receive. uDecide® is an intelligent, patented self-learning algorithm that takes your customer data and determines your next best conversation with each customer. uDecide® works well as a stand-alone product and is built customised to your industry needs.